While Googling for an old blog post of mine, I stumbled upon which appears to be several fairly aggressive “estate planners” hawking either overpriced “Estate Planning Organizers” or living trusts on the internet to the South Florida community. I put “estate planners” in quotes because these are not attorneys, but might be representatives of a well known compnay that has been fined and sued, provides worthless documents to their customers, and causes real attorneys that are associated with them to get in serious trouble with the Bar. Each of the three above sites features a different “estate planner” with a little welcome video. The first two links are the exact same site except with a different name and video. The third site isn’t the same template as the first two, but with the same information. This is funny. Each of the three “estate planners” claims either in their videos or on their sites that they have “created” a “free estate planning program” which they will give you if you sign up for their mailing list. Now the local community of estate planning attorneys is rather small. I either personally know, or have at least heard of most of the attorneys in the area. But I’ve never heard of any of the above three people, and looking them up on the Florida Bar’s Directory of attorneys confirmed my suspicion that they were not – and never have been – lawyers. I signed up on the second site above, and it turns out that the “free estate planning program” is a PDF mini-book entitled “Estate Planning 101: Wills Vs. Living Trusts.” After the title page, the book states that it was written by [Doofus in the Second Link Above], Estate Planner.” I kid you not. I will not publish it on my blog for copyright reasons, but you are free to go get it yourself. 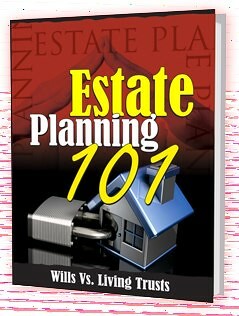 The book talks a little bit about estate planning basics, and isn’t even that bad. It even ends by saying, “The next step is to locate and work with a top-quality estate planning attorney. I invite you to give my office a call so we can discuss how we can help you outline your desires, explain what you’ve learned about estate planning so far, and investigate each of the areas outlined in the report in detail.” So the book tells people to get an attorney – nothing wrong with that – at least with the “attorney” part. But I knew that there was no way that this doofus could have written this book (especially if the other two doofuses were hawking the same book), but I wasn’t sure what they were actually trying to sell, and who they really represented, so I started to investigate a bit further. On the bottom of the first page it states “Copyright 2012 by the Estate Plan Center, LLC“. Searching for “Estate Plan Center LLC” brings me to this site, in which the company is hawking an “Estate Planning Organizer.” Apparently, the Estate Planning Organizer allows you to gather all of your relevant information -family, finances, etc., and put them in one organized place, supposedly, to meet with an attorney to go forward with your planning. It’s actually not a bad idea, and it’s probably pretty good. However, they’re selling it for $197, which is way too much money, assuming that’s what they’re really selling. Here’s the thing. Again, going through what they claim to be the actual Organizer itself, it looks like it may be a worthwhile product (although again, not worth $197). If I thought that they were only selling the Organizer, I wouldn’t care. But there is something else going on here. First, the Organizer comes with “bonus” material such as “Living Trust Answers – Discover how to Plan, Prepare, manage and Settle a Living Trust” and “How to Avoid Probate – Your Step-by Step Guide for Transferring Assets into a Living Trust.” So I’m starting to wonder if they are selling the Organizer at all, or if it is a loss leader for their Living Trust program. Second, the affiliate websites really make it sound as if the principals were lawyers. On these websites, these scammers are calling themselves “Living Trust Advisors.” One website states, “I am an Estate Planner in Coral Springs. For over 10 years I have been specializing in the preparation of estate planning documents & living trusts throughout Florida. I have successfully helped over 100 families plan for the future by preparing a proper estate plan.” Another states, “I am a Estate Planner in Pembroke Pines, Florida. For over 34 years I have been specializing in estate planning & living trusts throughout South Florida. I have helped close to a thousand of families set up a rock solid revocable living trust and I can help you too.” They even aren’t selling the Organizer on the sites. Not specifically. Instead, all of the sties talk extensively about “Living Trusts” again and again. If they are only selling a financial organizer that people can use to take to their attorneys, why are they pushing Living Trusts so hard? Living trusts are right for some people, in some states, some of the time. Anyone who tells you that everyone needs one all of the time, regardless of age, marital status, wealth, and where they live is full of it. In 2009, a $16 million default judgment was entered against them for “masquerading as qualified financial advisers, estate planners, lawyers, and paralegals to exploit and prey upon senior citizens with the creation and selling of “unnecessary and often useless living trusts. So here’s the real question. Why do I care? I’ll tell you a secret. I make a hell of a lot more money probating estates in which the planning wasn’t done properly, than I do by actually doing proper planning. If I was only interested in financial gain, I would tell everyone to go out and use one of these trust mills, because I know that they would be messed up, and when the person dies, they would have to hire me to fix it. I care because these scammers are harmful to society. They rip people off, and sell them ineffectual products. They are practicing law without a license. They don’t know what they’re doing. They are giving people false peace of mind. I reported the above web sites to the Florida Bar this morning. Hopefully, they will be able to do something. Moral of the story? It’s a minefield out there, and scammers are getting even more aggressive using the internet. If someone calls themselves an “Estate Planner” but is not an attorney, run away.